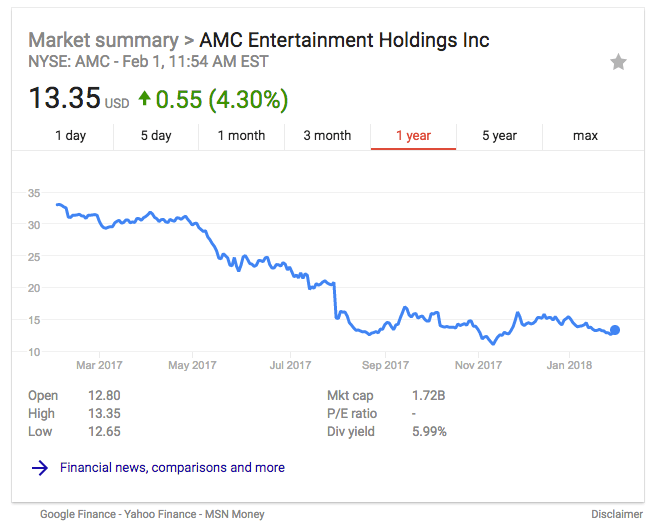 AMC Entertainment has traditionally been one of the dominant theatre chains in North America, with about 8,218 screens and over 300M total yearly attendances as of 2016 (1). Majority stake holder Dalian Wanda acquired the company in 2012 for $2.6B. Since, AMC has proceeded to make strategic acquisitions by consolidating several US theatrical movie chains, more rapidly opening up theatres globally including new screens in Wanda’s mainland china, and increasing the prices for ticket entrances as well as concession consumables. From the perspective of a legacy theatrical chain, these were probably logical decisions. 1) use scale to grow through acquisition, 2) increase number of screens globablly, 3) increase profit margins by raising prices and downsizing operations. But as a consumer who went from attending a theatrical exhibition two times a month, to two times a year, this was a foolish set of decisions. 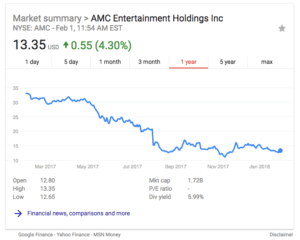 AMC Entertainment’s bet has been to double down on their $5B theatrical business in an effort to combat new streaming giants Amazon and Netflix and a generation of consumers being entertained at home. AMC has made several very inexpensive and low-quality attempts to appeal to millennials by promoting loyalty programs, integrating points with vendor services like fandango, and very late attempts to introduce more improved experiences such as IMAX. The problem is the mindset of a theatre operator. Theatres have always been slow to adopt new technologies because of the large capex costs it takes to implement them, as well as the risk that consumer tastes may change away. From IMAX and 3D to digital projectors and newer cinematic experiences like rumbling chairs or surround sound built into seating; national theatre chains have always waited for innovators to improve experiences and then they carefully hand-select the features they feel will provide the fastest ROI. Getting a theatre owner to invest in quality is like pulling teeth. As long as they are not innovating on the theatrical experience, they will struggle to participate in the upside of improvements. 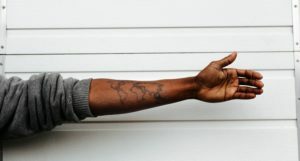 The average American under 25 years old leaves their home 2.3 times a week for non-work or food related reasons (down from 2.9 10 years ago) (3). Is an old outdated theatre really going to be one of those 2.3 times that the future generation leaves? AMC, and other theatre chains, have foolishly left a white space for new exhibition formats. Everything from AR-improved screens and theme parks, to niche high-quality arthouse theatrical chains like the Alamo will continue to steal away devout fans, younger movie-goers, and those intrigued by the latest and greatest. The bread and butter of AMC has mostly resided to the elderly, parents bringing their young kids during the day, and the traffic from the only four or so monster-blockbuster hits that are distributed a year (i.e. ‘ The Last Jedi’). Having understood now how GE transitioned and pivoted its main hardware business into a software + hardware business despite naysayers proves to me that there is a way incumbents should act if they plan to be here for another 50-100 years. 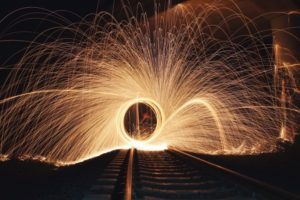 GE’s stock price may have been dropping since all of the digital change that Immelt implemented, but they still have a fighting chance of being relevant in the future. I believe AMC’s equally poor stock performance above is an example of a company that has chosen not to pivot, is ignoring the writing on the wall, and instead is doubling down on their outdated core competency hoping international growth will keep their business alive. As soon as there is a movie chain with an AR enable screen, table service, and maybe a subscription-model movie ticket price (i.e. what MoviePass is trying to do) I think I will be ready to leave my Netflix at home and go see a film with friends at a ‘theatre’. Very interesting and worrisome, especially as someone who loves going to the movie theaters! I think the comment made earlier about MoviePass is definitely promising, and it does help remove some of the initial pain points for many people. It’ll also be interesting to see the responses from movie studios and whether or not these theaters would eventually lose their bargaining power against companies like Netflix and Amazon. One way to remain competitive for AMC is to potentially partner up with movie studios to create new forms of movie content and experiences that only a movie theater could offer. Great post! Question for you – once VR technology becomes more ubiquitous, do you think movie theaters are destined for decline? It strikes me that the only difference then would be (maybe) audio quality (better), price (worse), and having to sit next to strangers (the worst). It’s interesting to see how the gradual decline of theatre going attendance hasn’t more drastically inspired radical change with theatres. It seems there is more opportunity to test out something truly new and unique in order to gauge what might draw viewers back. During the Field Global class in RC year, my team worked with PVR, a similar company to AMC, in India and they were trying a number of different tiered experiences to draw viewers. Theatres went from having sushi chefs trained overseas and fully catered meals at your seat to massive stadium style seating for a few thousand people. They were also exploring AR/VR and other interesting concepts using technology as well.